BBC NEWS | Have Your Say | Will IRA arms move be final? Do you agree with the DUP that there is a "very big question" over IRA decommissioning? DUP leader Ian Paisley said he was "shocked" by what he learnt in a meeting with John de Chastelain, head of the Independent Monitoring Commission. On Monday the commission said the IRA has put all of its weapons beyond use. What does this mean for peace for Northern Ireland? What next for the peace process? Will this instil confidence in the unionist community? I'm delighted with the news of IRA decommissioning, and think it a great leap of faith by Republican paramilitaries. Such faith, however, seems sadly lacking among the Unionist side. It seems to me that their calls for photographic evidence which slowed up this whole process in the first place were less concerned with proof, and more with adding insult to injury. It's really up to the loyalists now. They can come to equitable terms and accept the Catholics as their countrymen or if their own incitement and arrogant violence continues, risk the IRA rearming and forgetting about any peace at all for generations to come. That is everyone's worst nighmare. Trust is always going to be difficult in the near term. However, this announcement from a an independent commission is worthy of a measured positive response. Has the IRA actually destroyed its weapons? Has anyone in a credible position seen any hard evidence on this? Everybody is happy to that the IRA has decommissioned, but with no evidence of what they had in the first place are we jumping the gun that they have totally decommissioned? This is a promising, hopeful time for peace in a country devastated by sectarian violence. It is time for the Unionists to accept that the Republican movement is legitimate and democratic; it's time for the British militias and soldiers to get out. From what I've seen no one has put enough pressure on these loyalists to lay down their weapons. I feel strongly that this is the tipping point for everyone In Northern Ireland. The North Irish themselves have to decide if they want to stay firmly entrenched in the bigotry and violence of the dark past or to have the courage and honour to seize a brighter future for their children. I don't think the arms dealers will let it happen. It only takes a killing on either side, (irrespective of who did the killing) to start the shootings again. Only time will tell. While I think it is a positive step in the right direction for Northern Ireland, I will believe it more when the armed loyalist groups disarm. Rev. Paisley and his political party will never be happy with any peaceful overtures from Sinn Fein and the IRA unless there overtures are done on Mr Paisley's term and conditions. As a Unionist what reason have I to believe the word of an organisation who have spent 30 years trying to destroy my community? I have no reason believe the word of terrorists and murderers when they say they have destroyed everything. It is naive to think that photographic evidence would be proof of decommissioning. Photographs can be faked. People like Ian Paisley know this and are simply playing a political game. He wants the IRA to undergo a humiliating public surrender. Secondly he is determined not to share power with Catholics or anyone who represents them. I would never endorse IRA terror. It is also clear to me that the last thing Ian Paisley wants is peace. His reason for existence would disappear. Getting rid of the guns is one thing but the expertise of the bomb makers is hard to put out of harm's way. I do not trust these people they are being forgiven and released from jail and are still stabbing innocent people. I'm curious exactly what photographs the IRA could provide that would prove to Mr Paisley that their weapons no longer existed? One would have to be very naive to think the IRA gave up their weapons. No one knows for sure how many weapons they had in the first place and no one knows for sure where the weapons were being stored. This looks a bit like a shell game. Now you see them now you don't. The decommissioning is a very astute political move, removing a major source of criticism of the Republicans by Unionists. Demographic trends being what they are, it is inevitable that Unionists are going to have to cede power and learn to co-exist with the majority of the population. I hope the transition is non-violent but it will happen either way. I doubt it's final. If they were really serious then surely they would have destroyed the weapons rather than 'putting them beyond use'? Fingers crossed though. I think Paisley needs to recognize the massive steps towards peace which have been taken by the IRA. Yes it's still not perfect, but being the first minister he must show willing to meet halfway. Ian Paisley needs to now ask himself how he wants to be remembered by posterity: as the man who blocked a return to devolved government or as the first DUP first minister in a genuine power sharing executive. A minority of Northern Ireland may prefer the first, but the rest of the world would prefer to remember him for the second. I am certainly no fan of the IRA or their political wing but I must applaud them for this move. I too would have liked to see more transparency on the issue of final decommissioning. What would make Gerry Adams and Martin McGuiness true heroes and potential statesmen would be if they took a few of their ideas and shared them with certain factions in the Middle East, Israel, Palestine etc. I don't think the IRA will give up their weapons as they pulled out of the Good Friday Agreement. If the IRA has indeed put all of their weapons beyond use then they have indeed struck a significant political blow against the Unionists. The question of decommissioning was used to great effect by the DUP in the last general election and with the recent violence coming from the unionist Orange Order, they are now on the defensive. After this gigantic move by the IRA, it's time now for Ian Paisley and the DUP to move forward and embrace power sharing or are they still stuck in their 1690 mentality? I never believed I would see an IRA ceasefire, I never thought I would see IRA decommissioning. Thank God I've been proved wrong. I hope that all will now embrace this and make the most of this wonderful opportunity for my children and my children's children. Yes, I do believe it will be final but just watch the provocative comments now from the Unionist camp. Because when the IRA is no longer active what sway will the unionists have over their own people? They will no longer be able to call Adams and McGuinness terrorists and they certainly will not want to call them politicians. I believe that the IRA decommissioning is genuine, however it should have been more transparent, even if only to silence those like Paisley who will use the doubt created by the secrecy of the process to fuel unionists' fears. It's a question of transparency. We are expected to take the word of two witnesses nominated by the IRA and a body which will not produce a shred of evidence that all IRA weapons have been put beyond use. Where are the inventories? Where are the maps showing the locations of the arms dumps and the photographs showing them empty? Where is the footage of the destruction of the weapons? Until these are provided, it is impossible to be certain that the IRA has disarmed. The DUP's response to this historic news is a disgrace. Isn't it simply the case that the IRA has realised that democracy, not violence, is the only way to advance the Republican cause? At last we see the light at the end of the tunnel, people in Ireland must now give this a chance to work and I'm sure it will. What we need to happen now is for the heads of churches get together to resolve their problems, and stop these religious arguments. Best of luck all of you who genuinely want peace. Decommissioning gives breathing space, but no more. The problem remains. The Republicans still want a united Ireland and the Loyalists don't. Someone will be disappointed - and as we have seen when all else fails the losers will reach for the bombs and the bullets. All that can be hoped for is a stalemate, or a compromise. And the longer the uneasy peace continues the better the chances that a middle way can prevail. It's a very positive move but what about the 'real IRA'? No one has said whether their weapons were included? If not then it changes nothing. The next stage will be interesting - loyalist decommissioning? I think that will be much tougher to accomplish. Paisley and the DUP will never accept anything the IRA or other Republican movements do, because they simply don't want to. Paisley and his friends will continue to move the goalposts. Without independent verification, this statement means nothing. If the move is genuine, why the secrecy? This is truly a great achievement and proves that dialogue works eventually. I can understand some scepticism - the conflict is still to recent and was so brutal to be forgotten easily. But one has to ask what Ian Paisley is trying to achieve. It is time to move on and get on with returning Ulster to be governed by its elected assembly. The IRA decommissioning is hog wash. Why if they decommissioned was it done in such a clandestine manner? Why have we not seen footage of the weapons being decommissioned? Why did they appoint their witness? More lies from a terrorist organisation. What the people of Northern Ireland need most are politicians who can deliver a lasting peace. Forget the past: it is time to move on. Now is the time to start talking and resolving the issues. Sadly there will be criminal elements seeking to exploit the current situation, and there will be the usual parties who are only too willing to say no to any initiative. Where are men like David Trimble and John Hume when true leadership is required? Whilst I never had any time for Sinn Fein or the IRA, I do applaud this move and hope it is genuine. As to Paisley and the DUP's response, it is completely expected. It is a welcome day and I truly believe that, due to world opinion on terrorism now, that the Provisional IRA will not return to violence, but I also have no doubt that they will retain some arms as they will no doubt believe that it would be sensible to do so. Time will tell. I think it is time that the Unionists, especially Paisley came to realise that it will never go back to the "good old days" of "our Ulster". These men were given a mandate for peace in 1998 and still they have not finally delivered what the people of Northern Ireland voted for then. Enough is enough. So they disarmed eh? Does not take long to purchase or make another weapon though when things do not go in your favour. How about a long-lasting commitment to peace (with resolving things through talks)? I am a loyalist, and therefore a bit sceptical about the whole peace process. However, if the IRA is willing to allow inspections of the weapons and there is nothing dodgy - I say we give it a chance.....after all, what do we have to lose? How long for? Only time will tell. The situation in Northern Ireland while improved is still far from satisfactory. In the end a period of peace is the only really satisfactory way to tell if the armed struggle has ended. Why is it so difficult for people to believe that the IRA has turned a corner? Should we not focus more on grabbing this moment we have for an everlasting peace? I am hoping that this will be a big step towards peace. However, having grown up in Derry and witness the IRA's "campaign" first hand, I am finding it very hard to believe that it would give up all its weapons. For one thing, no-one knows for sure how many weapons they had in the first place - how can we be so sure all have been removed? I think it is a positive step and should be welcomed. People should stop being negative and move forward otherwise the country will regress. I now think that the Unionists have to take a step forward and show that they also want peace. Can we please stop all the nit picking? The only way forward is to act like adults and try and put some trust in the process. Too many people are determined to break it at any cost. Let those who care about peace show the rest how to act with dignity in the move toward a safer, happier land. As a member of a family bereaved by an IRA bomb, I hope that this is seen by others as a positive step and not and empty gesture. Let's hear some good news from some of the other factions now, please! I can only welcome the announcement, though I take it with a pinch of salt at least for a few years. I still feel the lack of trust from the Unionist side, so I am not convinced that the IRA will not unearth the hatchet when provoked. Permanent peace will take time. Years of rampant mistrust may have slowed down the peace process but it's better to be late rather than not making peace gestures. I hope that the IRA keeps its words to pursue its aims through democracy. This certainly gives Sinn Fein and the IRA the political "high ground". I am sure that the response from the DUP (and hopefully the loyalist militias) will reciprocate this bold move. 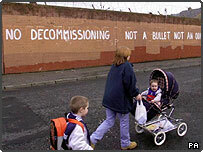 Having grown up in NI I am completely sceptical about this so-called decommissioning. The IRA will be witnessed pouring concrete into a few holes in the ground. No one was allowed to inspect the holes beforehand to see if they were bunkers and did indeed contain weapons. No one is permitted to photograph or film the process. It's another stunt by republicans to extract more favours for doing nothing. Their weapons remain in other places, ready for use when the concession gravy train threatens to grind to a halt, or to attack loyalist areas when the military presence is reduced far enough on the back of this token gesture. If only it was genuine! I am very encouraged by the progress. There seems to be a real will to move forward, which is the exact opposite to the expectations immediately after the elections in May. Ireland seems to be finally calling the bluff of the corrupt few, who don't want to see the end of their drug running, or protection racket running by ending the "war". That's a good thing, letting politics and democracy sort out the problems. I really hope that they are genuinely decommissioning, and that one day, us Brits can leave Ireland, and watch it be reunited, with the two major religious peoples living in harmony. The old style of confrontation by people like Paisley should be left in the past. I can only hope so, as a young merchant seaman in the early 1970's I was ashore in Londonderry/Derry and ended up in a very strong IRA bar by accident, (Beer in brain out) on ordering a drink, when they heard my English accent you could cut the atmosphere with a knife, I was asked my name, when I told them, I was told, 'that's a good Catholic name, you'll be all right, but for my companion to keep his mouth shut, and once it was established that we were just a couple of seaman ashore for the night all was fine, at closing time we were given safe passage back to the army barricade, much to the surprise of the soldiers on duty. Even in the US, Americans found it hard to believe that there is no hatred for the ordinary English person, it's or hopefully was political, not personal. I wish all in Ireland many years of peace. Yes, this will be final - now is the time for the Loyalists to do the same, and for the British government to withdraw the last of the troops. The first paramilitary grouping to carry out any weapons decommissioning, the loyalist LVF, were prepared to have their weapons destroyed in front of television cameras. If the IRA really wants to gain Unionists' trust why can't they follow this example? The ordinary people of Northern Ireland, who suffered so much from illegal arms carried by extremists in both communities, deserve transparency and honesty much more than the IRA deserves to have its pride protected. How can either side of the divide here really accept or how can the IRA expect them to expect that all the weapons are gone with out photographic evidence. If Protestant organisations can have their weapons destroyed on TV why can't the IRA? It's like the Good Friday Agreement, a complete joke. What proof? So let's get this straight. A country hundreds of thousands of miles away doesn't threaten us, doesn't have any WMD, has never attacked us, and yet we send weapons inspectors in who find nothing, we say there's no proof, and we blast them to smithereens. The IRA have the weapons, have historic use of using them to kill us, won't allow any inspections, and take years to finally say they've got rid of them. And we say "ok then, we believe you". Madness. If the IRA were truly committed to the rule of law, they would have handed in their weapons openly at police stations on timescales determined by the democratically elected governments - as UK pistol shooters did in 1998. This hole-in-a-corner how-we-want when-we-want business only underlines their contempt for the peaceful majority. I hate to see so much negativity when things like this happen. Maybe if wee all took a positive approach to things then maybe this place will change. This is very much a good news story. Now what needs to happen is for the INLA, CIRA and RIRA to be stood down and on the Protestant side the UDA and UVF need to decommission all of their weapons as well , then disband. Then we can be confident that as we move towards a United Ireland, we will not be living in feudal fiefdoms but in a modern liberal democracy. There is more chance of peace from the republican community than from the loyalist one. However, the need for both sides to sustain organised crime will ensure that weapons remain a significant feature of NI life. If it turns out that the IRA have indeed put their weapons beyond use, it will leave the spotlight on the Unionist parties. Will the DUP and others accept that a power-sharing executive is inevitable and work with Sinn Fein and others, or will they merely make excuses and disrupt the return of a Northern Ireland government? The IRA seems to be delivering, but unfortunately the Unionists, and particularly the DUP, never seem to be happy with IRA concessions. Hopefully this time they will. When are the Unionists going to follow suit? I don't think the question is "Are the IRA decommissioning", because there are witnesses who can attest to it. I think the question is "When are the Unionists going to follow suit?" It has to be the same for both sides in this, what goes for one must go for the other or there will be no peace. The IRA have finally dropped their weapons, something that Paisley and co kept on about, now will they honour their side of the bargain remains to be seen. Quite simply put: no. Ireland is a breeding ground for trouble and even if the IRA do stop fighting, the ordinary people will carry on for much longer. If this actually works then wonderful. But I will remain sceptical for a few years. The IRA are prepared to do whatever it takes to get their objective of a United Ireland. Currently they judge that a peaceful approach is their best hope. However, this has only worked because of their violence in the past, which the government has made concession after concession to appease. So we have peace now because it suits the IRA. But I don't believe for a minute that they will stop here. As soon as the process comes to a halt and they stop getting concessions, they'll be back to their old ways.